Opened in December 2017, the Bvlgari Resort & Residences Dubai is the latest jewel in the designer brand’s luxury hospitality collection. Situated on Jumeira Bay – a manmade island carved into the shape of a seahorse – the 158,000sqm resort was conceived as an ‘Urban Oasis’ for visitors and residents alike. 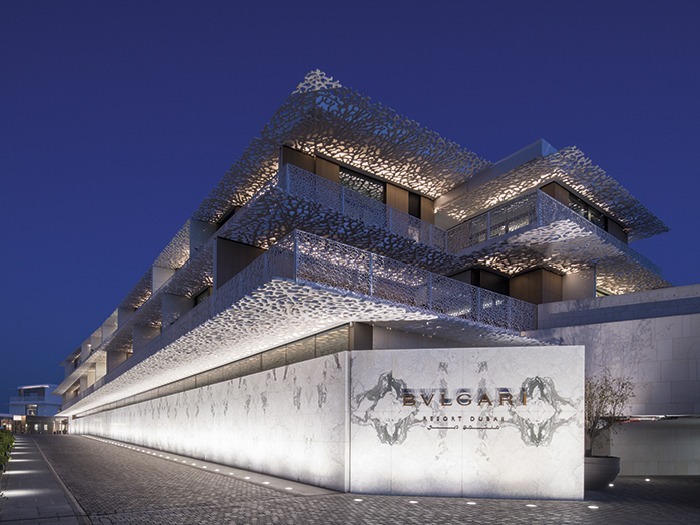 Designed by Italian architectural firm Antonio Citterio Patricia Viel (ACPV), the resort is a ‘first-of-its-kind’ development for Bvlgari, both in scale and magnitude. The complex features the hotel building and villas, six residential buildings with 173 sea facing apartments, fifteen private mansions and Bvlgari’s first Marina and Yacht Club, and is intended to resemble a traditional seaside village in southern Italy. The architects worked alongside Italian lighting design studio Metis Lighting, who have worked on several projects for the brand, to develop the architectural and lighting design concept for the resort, drawing inspiration from traditional design, combined with Italian architecture and accentuated by Middle Eastern touches. 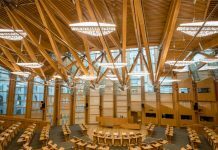 Local firm Delta Lighting Solutions carried out the lighting design development and execution, while Huda Lighting supplied the fixtures and luminaires. Metis Lighting has been working with ACPV and Bvlgari for more than fifteen years, dating back to the Bvlgari Hotel Milan in 2002, and Marinella Patetta, co-founder of Metis Lighting alongside Claudio Valent, explained how collaborative their work with ACPV is. “The lighting project is launched together with the architectural and furniture design,” she said. In creating the lighting design, Patetta explained that Bvlgari has certain design standards and guidelines for the main lighting criteria, such as lighting levels and scenario control, but added that these are not very restrictive and are “totally in line” with ACPV design, meaning that they are fairly easy to adhere to. Once the lighting design concept was created, Metis and Delta Lighting Solutions worked to ensure that it was implemented effectively. Patetta continued: “Most of our work after the concept is focused on maintaining and developing the initial ideas without substantial variations. The lighting concept for the resort aimed to recreate the warmth and simplicity of a charming Mediterranean village. The approach was very minimalistic and subtle, with all architectural light fittings, provided by the likes of Traxon, Flos, Light Contract, Lucent Lighting, LED Linear, KKDC, Erco, acdc and Radiant Lighting, concealed and kept in warm colour temperatures. The remarkable design for the resort features a blend of styles, fusing traditional design, contemporary Italian architecture and Middle Eastern touches, and Patetta believes that Italy’s mixed heritage led to the varied design. Once the lighting design concept was in place, Delta Lighting Solutions was brought in to handle its development and execution. Although joining the project halfway through its development, Ziad Fattouh, Managing Principal of Delta Lighting Solutions, says that he enjoyed the process. Lopez-Yanez added that, despite coming in once the initial designs and concepts had been completed, there was still room for creativity on her part. “While working on this project, we learned that creativity is not only used in the initial conceptual, artistic phase, but that creativity is essential in developing ideas and turning them into a reality. 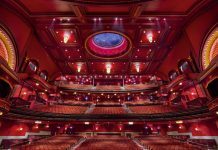 The sheer scale and complexity of this project meant that transforming the initial vision into a reality required a lot of collaboration and coordination between the architects, engineers, lighting suppliers and lighting designers. Because of this, Lopez-Yanez and her team had a vital role to play. “The complexity of this project was evident in the design phase, but we got to experience it even more during the site supervision phase, when the design had to be executed by the contractor,” she explained. An example of this came in lighting the hotel’s façade. This is defined by a warm glow of coral-like brise soleils or sunscreens made of matt white GRP, which is a reference to traditional shading techniques in the Middle East. As the brise soleils follow an irregular geometry, this made it difficult to integrate the Traxon linear light fittings. As Lopez-Yanez explained: “With over 30 different variations of the same typical detail, it was one of the most complex exercises, as it required coordination between the architect, engineers, the manufacturer of the brise soleil, and of course the lighting. The way in which all parties came together to collaborate on this project is a testament to its success, and Lopez-Yanez feels that this teamwork helped to make what could have been a difficult project a lot easier to complete. “It was a daunting experience at first, knowing how big and complicated the scale of work was, but we worked with very proactive people who made the design coordination a lot easier,” she said. Alongside the integrated architectural lighting from Osram, acdc, LED Linear, Aldabra and Lini LED, among others, the Bvlgari Hotel & Resort features a number of decorative and bespoke fixtures created exclusively for this project, with custom downlights from Lucent in all guest rooms, custom linear cove lighting from Light Contract, and decorative suspended lights from AggioLight. Metis Lighting and ACPV designed all the custom elements with clear references to Bvlgari’s brand identity, using motifs such as the eight-pointed star, and the geometric sequence of circles and squares. According to Patetta, these were “conceived almost as if they were ‘jewels’ to catch the eye and enrich the visual experience of the clients”. “In complete harmony with the interior design, lighting is also used to recall the luxurious and unique character of the Bvlgari brand and bring it to the new hotel’s building,” she added. Although the resort does feature a number of decorative fixtures and focal points, for the most part the lighting remains minimalistic and subtle, with a hidden warmth. It is this concealed beauty that Patetta feels makes the lighting scheme stand out. 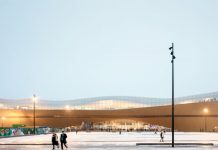 “We believe that a lighting project is successful when nobody perceives, at first contact with the space, that functional lighting exists,” she said. “If you first notice a technical lighting fixture, then the general location, something is not appropriate. Fattouh agrees that the subtle use of light adds to the sense of luxury that Metis and ACPV worked to create, adding: “The light was meant to be as discrete as possible, integrated and hidden, and used only to help capture the mood of a space. “The lighting scheme helps accentuate the richness of the finishes, and creates a sense of drama and luxury. Light was used sparingly and carefully, and only where we needed it, while avoiding the flattening effect of too much ambient light. “When you walk into this hotel, you get the feeling of luxury and elegance, but it is done without being ostentatious. Instead of using high ceilings and large chandeliers in the lobby to create a sense of luxury, you instead notice the highest quality finishes and the amount of thought put into detailing and integrating things such as light fittings, furniture and so forth. The Bvlgari Hotel & Resort Dubai is the latest in a string of impressive, grand projects completed in the Middle East, and since its opening, it has been labelled as one of the best new luxury hotels in the world, and for Lopez-Yanez, it was exciting to be involved in such a project, particularly in this emerging market. “The scale of projects in the Middle East never ceases to amaze me,” she enthused. “Coming from South America, there were a few ‘big’ projects like government buildings and airports that I worked on, but in the Middle East the scale of the projects is completely different. With their range of hotels, Bulgari’s aim is to convey the timeless glamour and heritage of its own Roman jewellery, and thanks in part to its beautiful design, this latest jewel is set to shine for generations to come.